All biological pathways in a cell are linked together and can interact with each other in unpredictable ways. When putting a pathway down on paper it’s sometimes hard to decide where exactly one pathway ends and the other begins. As such, borders between Pathways are nearly always completely arbitrary. My supervisor always says (jokingly) that a good rule of thumb is that a pathway should include only that which can fit on a single screen (and as monitor resolutions have increased in the past, so has the average pathway size). The two panels scroll together and you can zoom them in and out together as well. As this is all done in Java, it’s not much work to turn this into a little applet so you can view the pathway online, using good old-fashioned Web 1.0 technology. All this has the additional advantage that by letting the applet render the image instead of relying on SVG, I don’t have to let the browser render the SVG. SVG rendering in firefox has turned out to be quite buggy. 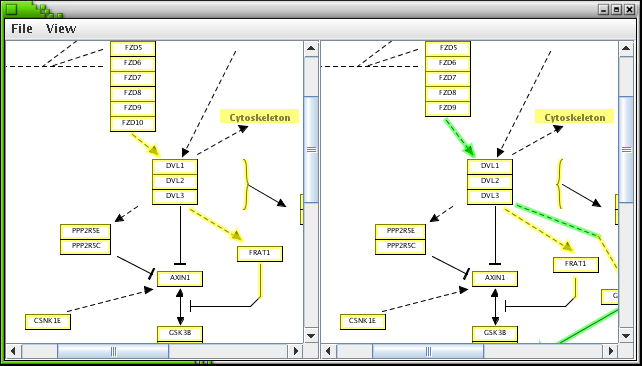 As the mid-term evaluation is underway, I reached a major milestone: My program can now output the difference set in SVG format, meaning that it is possible to compare Biological Pathways visually. In this screen shot you see two versions of the Acetyl Choline Pathway (very important for transmitting electrical signals between neurons). As you can see I’ve straightened out a few arrows in the new version (on the right). The yellow color indicates things that have changed, the text balloons in the middle explain in more detail which attributes of those things have changed. This pathway represents the Alcohol Dehydrogenase reaction (activated when you have a hangover 😀 ). In the image you can see I’ve added a few missing reaction compounds (in green) as well as set the label for the other compounds (in yellow). SVG output is only one of the possible output formats of GpmlDiff. Another option is to write to an XML-type format that I dubbed DGPML. DGPML is designed in such a way that it should be possible to write a patch utility that takes a GPML Pathway and then applies a DGPML difference set to it. In the context of wikipathways, I think there are a couple of interesting use cases for a patch utility. I didn’t think about this when I wrote my GSOC proposal, but I think this would be very useful. So useful in fact that I’m going to ask my supervisor Alex Pico if he thinks I should put it in my plan for the second half of the summer. My first target for Summer of Code is simple: to find a tool for extracting differences between two Pathways. Pathways are stored in gpml, an XML-based format. So my first idea was to look for an XmlDiff utility suitable for use in wikipathways. I spent some time reviewing all the various XmlDiff utilities out there. It turns out there are quite a few. And you know, if there are a dozen equivalent solutions for a certain problem, then you can bet that probably none of them are going to work for you. So while reading more into what makes a good XmlDiff tool, I found some interesting whitepapers that caused me to rethink the problem. I now believe it would not be hard to write my own version of XmlDiff that is completely optimized for my specific problem, namely finding differences between Pathways. With plain text, the differencing problem was solved nicely a long time ago with the famous diff utility. Basically it takes a text file line by line and considers if a line was either inserted, deleted or just changed. For this it implements the Longest Common Subsequence (LCS) algorithm. (Incidentally, I learned that the LCS algorithm is exactly the same as the Needleman Wunsch algorithm, well known in Bioinformatics as an old solution to the Sequence Alignment problem (see image). 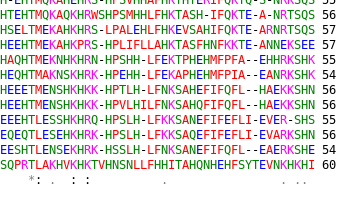 Clearly, Nature edits DNA Sequences the same way as we edit text files: Insertions, Deletions, Mutations). Now although XML is also text, it has a neat hierarchical structure that we would like to make use of. The line opeartions for diff don’t make much sense for XML. LCS also doesn’t cut it, so I had to read up on stuff like Nodeset correspondence and Tree correction algorithms. These editing operations just don’t make any sense for Pathways. A generic XmlDiff is unnecessarily complex, and has output that is hard to interpret. I’m already making good progress with the implementation of GpmlDiff. I only need to decide how to format the output. The only available standard is XUpdate, but that seems to assume ordered Xml. Suggestions are welcome too! Yes, I admit. Caught red-handed. I too am contributing to the ever-expanding Blogosphere. Recent events have triggered me to actually do something that was on the someday/maybe list for the longest time. This is the result. What recent events am I talking about? Why, I thought you’d never ask. I’m going to participate in this year’s Google Summer of Code! My project is entitled “Visual history of biological pathways“. I’d like to explain that a bit. I’m a PhD student, and my research involves something called Biological pathways. Biological Pathways are simply drawings of processes that take place within a Cell, for example, you could have an Insulin Signalling Pathway that schematically shows how Insulin activates the Insulin Receptor in the cell membrane, which in turn activates Ras / MAP-K proteins which in turn activate many other enzymes and glucose transporters which eventually leads to uptake of glucose from the blood. Representing pathways as simple drawings can be a useful research tool. My contribution to all this has been the development (together with fellow PhD student Thomas Kelder) of PathVisio, a pathway creation and editing program written in Java. It’s currently in Beta. At the same time, the research group where I work, BiGCaT Bioinformatics, was setting up a collaboration with the GenMAPP group at UCSF, San Francisco. GenMAPP was officially accepted as a Mentoring organization, and they asked me and Thomas to apply. I’m really excited about this, this is a great opportunity for me for two reasons: through the summer of code I can work closer together with the people at UCSF, plus I get to be part of a really cool open source event. Recently at GenMAPP they started something called WikiPathways (no prizes for guessing what that is). WikiPathways is what my Summer Project is all about. Basically it boils down to this: I think WikiPathways needs a history feature, so that you can easily see what other people have changed. Although this may seem at first like a minor detail, I think it is of immense psychological value for any wiki-like system. One thing is for sure, It’s going to be a very interesting summer!